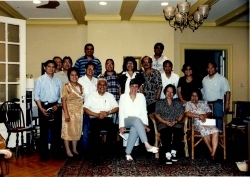 The dream of Silliman alumni and friends in North America uniting for common cause had been held by many for quite some time long before the first Tipon and the organization of SUACONA. There were many reasons for such a union. Fellowship was of course uppermost but a strong second consideration was financial. With the continuing decline of the mission support that had been a major source of revenue for nearly a hundred years, something was needed to take its place and it appeared that tapping the resources of the overseas alumni, a very large segment of which was based in North America, was part of the answer. In an article for the United Board newsletter entitled “Looking for Mr. Money Man,” the late Dr. Paul Lauby graphically illustrated the positive impact on Silliman's financial health of united Silliman alumni by saying that if each North American Silliman alumnus would give even just $100 to Silliman, the aggregate sum would help improve Silliman's financial picture dramatically. The question, he posed, was how to rally the Silliman overseas alumni to such a cause and by whom.